Dol-άs Spa | Spa Inc.
For many Canadians, the Maritimes represent the simple life; taking in the wonder of the picturesque landscape and the feeling of the sea breeze on your skin. For tourists looking for an East Coast escape, Dol-άs Spa, a 2016 Canadian Spa and Wellness Awards winner, is the perfect fit — and that’s not just because its name, Dol-άs, means “escape” in Scottish Gaelic. 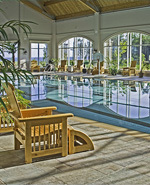 The Fox Harb’r Resort, home of Dol-άs Spa, is located in Wallace, Nova Scotia, right along the coast of the Northumberland Strait. Aside from the spa, the massive resort is home to multiple golf courses, riding stables, a junior Olympic pool, trails, and greenhouses, with options to rent or own on-site property. “Dol-άs Spa provides Fox Harb’r Resort guests with an additional luxury amenity that positions us as a world class destination resort,” says Kevin Toth, Fox Harb’r President. East Coast residents are best known for their hospitable nature, something Joann Patriquin, Spa Director, takes to heart. Patriquin personally welcomes the guests who visit the spa and says each day she hears from guests how bright, warm and inviting it is. Spa amenities include a lobby where guests can sit and relax while enjoying complimentary Wi-Fi, a fitness centre, hot tub, and a number of pools, including a saltwater mineral pool. “It’s like being in a tropical location,” says Patriquin. Out of all of the spa’s treatments, the most unique is the Fox Harb’r Signature Facial. It uses the Swiss skincare line, Cellcosmet, which was designed exclusively for Dol-άs by Cynthia Audet, President of Audessa Health Care Products. “We are the only spa east of Montreal permitted to carry this line,” says Patriquin. Audet approached Patriquin about designing the facial treatment at Fox Harb’r after the two met at a show where Patriquin sampled the Cellcosmet line. The signature facial is designed to work in combination with Dol-άs’ NuFace microcurrent treatment. Other standout treatments include the Gazebo massage, where guests can enjoy a close view of the sea cliffs while enjoying a stimulating massage, weather permitting. With hot summer weather and breezy waterfront winds, it’s not always the serene environment spa-goers are looking for. “It may not be for everyone, but we get requests for it,” says Patriquin. It seems that Dol-άs Spa can be the perfect place for guests and spa employees to find a real East Coast escape. After all, it’s in the name.